In 2016, QNIS completed a project to compile oral histories from our retired Queen’s Nurses. Interviews with nine Queen’s Nurses created “Voices of Experience“. Their interviews were filmed, and these videos provide an informative and colourful depiction of life as a community nurse across the latter half of the twentieth century. Each interviewee brings a unique perspective, creating a comprehensive look at the importance of Queen’s Nurses to Scotland’s communities. The interviews help to illustrate how training and practice have changed over the years, and are a fascinating piece of our history which we are delighted to be able to share with you. In this interview, Lorna talks about her life and career as a Queen’s Nurse covering a number of communities in the north east of Scotland. She discusses how district nursing has changed over the years, and the importance of developing relationships. Lorna indicates how for her, nursing in the community was about more than dressing wounds, it was about knowing the people as people, not patients. Relationships are a key part of Lorna’s interview, with bed baths advocated as a powerful tool for learning more about a patient. Being a district nurse close to Braemar meant more than a few encounters with the Royal Family and Lorna takes great pleasure in describing a number of these visits. 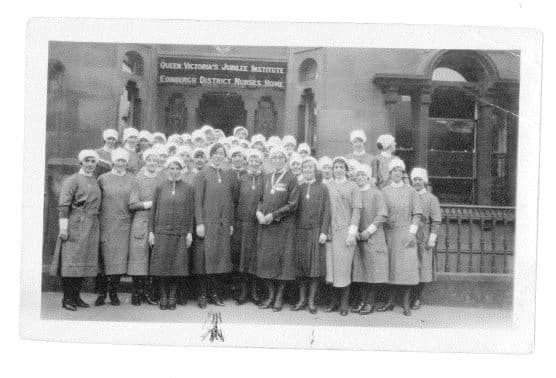 Jessie describes how she came into Queen’s Nursing by circumstance, but how she enjoyed the training, which included the many closes and tenements of the Royal Mile. She recalls the importance of health education, and how new innovations could be revolutionary. She describes the key difference between ward nursing and district nursing, in that on the ward everything was available, but in the district, nurses had to make use of what was available to them. Jessie details the emotional impact of working closely with people in their own homes, and how she still remembers some of the terminal cases to this day. She also outlines the benefits of the meaningful relationship with communities, how she’d return home to find someone had washed her car, or left a fresh fish for her dinner. One story shows the importance of screening, as everyone in Buckie was tested for diabetes, including requiring samples from all the men on the fishing boats! In this interview, Catherine describes her journey from Benbecula through Larbert, Glasgow, Falkirk, London, Taynuilt, Cambridge, Harris, North Uist, Barra, Eigg and back. She talks about how Queen’s training touched on everything, allowing the Nurses to become a form of social reformer. Catherine discusses the respect shown by the Queens, as guests in someone’s house, but also shown to the Queen’s as recognisable community figures. She talks about the use of innovation, and working with what was accessible in the house; commendably delivering a baby in the dark. Catherine’s first experiences with a Queen’s Nurse were as a child when there were monthly visits from the smartly dressed and kind nurse to the school in Benbecula. Fast forward a few years and it was Catherine herself providing those monthly visits. As with so many, Murdina had always wanted to be a Queen’s Nurse, and fondly remembers a QN delivering her young cousin. In this interview, Murdina tells her journey around the UK, with initial nursing training on Lewis, through Glasgow and Cardiff on her way to Queens training in Glasgow. She talks about her nursing career, spent largely on the west coast of Scotland, and in particular the benefits of being your own boss. One particular story, about a problematic labour when the closest hospital is 70miles away, shows how well respected the Queen’s Nurses were, and how problem solving was a crucial part of their role. Merrill is not only a trained Queen’s Nurse, but was also a Trustee of the QNIS, and even a one-time Nurse Director of the QNIS and this interview marks her out as a trailblazer. Working and training primarily in Edinburgh, this interview takes Merril back through her formative years as a young nurse with an interest in bacteriology, through to becoming an innovative district nurse. She talks about how she broke boundaries throughout her career, including becoming the first Practice Nurse in Scotland, working in a multi-disciplinary team alongside another prominent QNIS figure, Dr. Ekke Kuenssberg, which led to a career in management. Merrill explains how positively people considered Queen’s Nurses, no matter where they went and who they dealt with which is why she believes “there is something special about Queen’s”. Sheila has the distinction of having not only trained at Castle Terrace, but also having taught at Castle Terrace, in what she refers to as “an icon of a building”. In this interview, Sheila describes a career which also took in Ayrshire, Fife, London and Glasgow, where she was the matron of the first Marie Curie hospice which led to her being awarded Scotswoman of the year in 1983, and receiving an MBE in 1989. Sheila provides a detailed summary of how the principles learned during her Queen’s training helped her throughout her career. She describes how the Queen’s badge on a cap and a lanyard was an identity that people knew, giving wearers credence, permission and approval. Kathleen describes here her training in Bath Street, Glasgow, and her varied and successful career that takes in Greater Glasgow along with spells in Southampton and Surrey before becoming Director of Nursing for Argyll and Inverclyde Community Health Services. Within her interview, Kathleen talks about the variety of conditions and ailments a Queen’s Nurse could face and how there was no such thing as a quiet day. Kathleen reflects on how innovation and improvisation were often the most important skills of a Queen’s Nurse, including the dependable Queen’s Poke! As a Queen’s Nurse serving the communities of Orkney, Mary’s story provides a window into island life. This interview covers Mary’s early years, her midwifery training in Newcastle and her many years working across the islands of Orkney. This account of Queen’s Nursing in the 1960s and 1970s is of particular interest for those with an interest in midwifery, with stories of delivering babies on the various islands, and even in-between! Mary describes the lengths to which Queen’s Nurses would go for their patients, particularly where there is no alternative, supplying not only health care but social work, essential errands and, on some occasions, veterinary care! In this interview, Adeline describes her professional journey from initial training in Elgin, her Queen’s Nurse training in Glasgow and a varied career in Glasgow and the North East of Scotland. She talks about how the role of the District Nurse, and the relationship with GPs, changed during her career and describes the long and often exhausting hours of work involved. Hear the stories of the healthcare role of a taxi driver, the dog who ran away with a placenta and tales of extraordinary resilience. Adeline also talks about some of the incredible work she did which led to her being awarded an MBE for services to the support of cancer patients.